The constellation Auriga. Roll mouse over to see labels. Auriga is a prominent constellation, visible in the far northern sky in the months around February. Its brightest star, Capella, is the sixth brightest in the sky. Lying close to the plane of the northern Milky Way, it is littered with open clusters, including M36, M37 and M38. These are groupings of young stars, recently formed in the Taurus–Auriga molecular cloud. Auriga is identified in Greek mythology as a charioteer, usually depicted holding a goat and two kids. The star Capella forms the body of the goat, and its name translates as ‘she-goat’. There are various conflicting accounts of Auriga's identity in Greek mythology. One popular story is that he is Erichthonius, son of Vulcan, who was the first person to attach four horses to a chariot. Greek mythology has no explanation for why Erichthonius should be depicted holding a goat, and so the goat was probably once a separate constellation which has been awkwardly merged into Auriga. 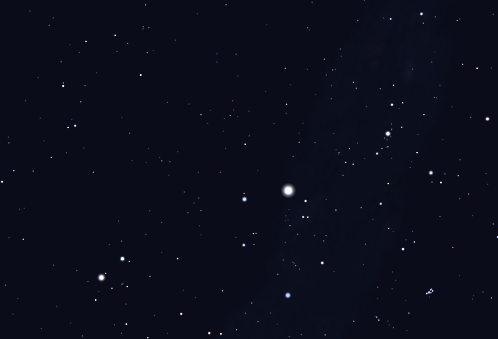 Auriga contains the following Messier objects: M36, M37, M38. Auriga contains the following Caldwell object: C31. 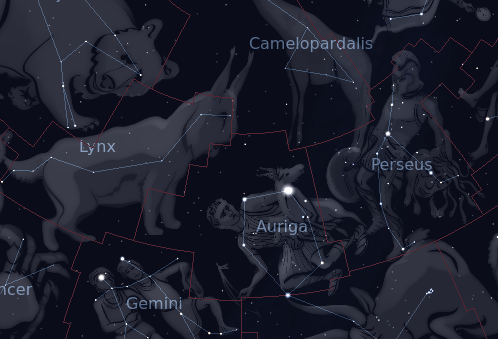 The following constellations neighbor Auriga: Camelopardalis, Gemini, Lynx, Perseus, Taurus.